Many people are afraid to go to the dentist. Fear of the dentist is called Odontophobia and according to the Phobic society this nearly always stems from a bad childhood experience. Many of us will associate a visit to the dentist with a clinical atmosphere, strange antiseptic smells and a range of frightening looking instruments. However dentistry today is different. Dentists have become patient friendly and the profession now has more sophisticated techniques. 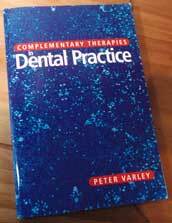 Peter has written a book titled "Complementary therapies in Dental Practice," which provides a timely look at complementary therapies in the area of dentistry. The book outlines the ways in which complementary therapies can be used everyday in dental practice or, if more appropriate, in which direction a dental practitioner can refer a patient. Growing numbers of dental practitioners are referring patients to specialists in alternative therapies. The aim of this book is to make more people aware that alternative therapies have a place in the practice of dentistry. Since the formation of the British Homeopathic Dental Association in 1989, interest in homeopathy or alternative methods of treatment has grown considerably, and there are currently over 150 members. Glasgow University also runs a very successful course in Homeopathy for dentists. During the last decade, interests in TMJ Dysfunction and associated headaches has grown, and dentists looking for more effective ways of treating this syndrome are turning to Cranial Osteopaths and Chiropracters. Also, the controversial issue of the use of mercury in amalgam fillings is something that is gaining more publicity, with patient pressure causing dentists to look more closely at the role nutrition plays in oral health. The editor was the Chairman of the British Homeopathic Dental Association until February 2001 and works for a very successful holistic dental practice in London. He recruited a team of specialist authors to contribute to the book. Dr Varley does not agree with all of the views expressed throughout the book. To read shorter articles that summarize each chapter, click on the chapter title in the list below.